If you are into manufacturing, importing, exporting or wholesaling business, having a warehouse for the storage of your goods is very indispensable. 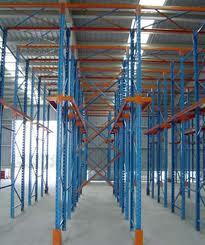 A warehouse could be a plain building in your locality or areas. You can either build one or rent for the purpose of storage or sometimes as a place to display your goods. Pallet racks are essential in any warehouse racking system as well as forklifts trucks that are used to load pallets onto the racks. The most common pallet racking system is drive in and drive through. This racking system uses forklifts to load pallets into bay area that have one or two entry areas. The Drive in system uses the “Lifo” (last in; first out) methods of storage system because it uses one entry at only one end of the lanes of stacked rows or bay areas or on the storage floor area. Drive in racking is common for small business that aims to have an ideal economical bulk storage solution. Goods can be loaded or retrieved in bulks by forklifts. Businesses that do not have high concerns on stocks rotation and goods selectivity benefit well using this pallet racking system. On the other hand, when the bay area has two entry points (usually at both ends) driving thru system is most commonly used pallet racking system. This storage management uses the Fifo system or the first in, first out methods as forklifts have more easy access and areas to load and push the goods to the end area of the stacked rows. Goods that have expiration dates usually have this kind of racking system or goods that have high concern on shelf life. For small business, minimizing production costs is very essential and mobile pallet rack that uses mobile shelving units that double the storage capacity of any storage space has help in minimizing storage as well as construction cost for a warehouse. Renting a warehouse is also a good idea in minimizing storage costs. Most of these warehouses are already equipped with pallet racking system and you just choose the warehouse that offers the appropriate racking system for your goods storage needs. When renting, it is advisable to consider the proximity of your warehouse for easy dispatching and loading of your goods. A place where you store your goods plays an important role in delivering high quality products and serving your customers. A good warehouse for your goods does not only provide storage place for your products but most importantly assures that your deliveries meet your costumers’ demands.